The Shun Classic Produce Knife is designed for preparing larger fruits and vegetables, especially those with thicker, tougher skins or rinds, such as melons, squash, or pineapple. This beautiful, mirror-polished knife offers a large 12" blade that enables you to cut all the way across even the largest produce, while the straight edge makes up-and-down chopping easy. The blade is made from a thick stock of AUS8A stainless steel. For beauty and enhanced stain resistance, the blade is mirror polished and it shares the same razor-sharp edge as the rest of the Shun Classic line. The beautiful ebony PakkaWood handles are rounded for a comfortable and balanced grip and riveted to the blade tang. 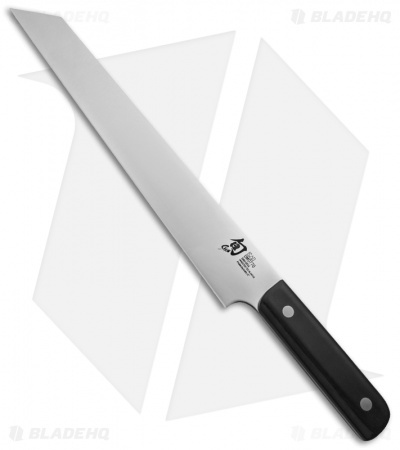 The Shun Classic Produce Knife is ideal for home use as well as for use in commercial kitchens. As part of the Shun Classic line of tasteful and contemporary cutlery designs, the Shun Classic Produce Knife is one of the many traditional culinary blade shapes and cutting-edge designs available in the Shun Classic line.